It’s been a long time coming but our master bedroom is finally turning the corner towards completion. One thing I desperately wanted to update in the room was the window treatments. The old ones, while pretty, were so heavy and they had blackout backings that made our North facing room even darker than it already would have been. They had to go. Well, I was lucky enough to review new window treatments from Blinds.com for our master bedroom! Blinds.com has tons of window treatment options in custom sizes and hundreds of colors. Roman shades, cellular shades, blinds, you name it, they have it. They also custom fit them for your windows. Just measure (they offer great instructions on how to measure) and they’ll fit them to size. If they arrive and don’t fit they offer the SureFit guarantee which means you can exchange them 100% free of any charges. On top of the HUGE selection they have they also offer virtual in-home design consulting called face2face. You get to work one on one with a designer via video chat on your computer, tablet or mobile device and they’ll help you choose window treatments that will give just the right touch in your room. Don’t you just love the digital age?! I worked with one of the designers myself. We chatted and I told my designer, Lauren, what I wanted for our room. I wanted it to be bright and light but most of all safe for my children. That meant a great cordless option that lets in lots of light. Our designer suggested a cellular light filtering shade and we worked together to select a color. Once we decided that was what we wanted to go with my designer helped select some color options and sent me 10 different options to check out in our room. Our new cordless blinds are great, they let all kinds of light in and give our room a whole new feeling. You don’t wake up feeling like your in a dungeon and that makes all the difference in the morning! The cordless option is perfect for my family because there are no cords for the girls to injure themselves on. To put the shades up or down you can just use one hand and lift them and stop where you want them. They go up and down smoothly and even handle my 3-year-old pulling them up and down now and then – so I’d say they are very durable! I’m so happy we got to work with a designer from Blinds.com to update our window coverings. There are just so many different options to go with and having a professional guide me along the way made all the difference. The blinds we chose are a linen texture in a nice calming off-white shade. It’s such a soft and pretty look for the room. I now have window coverings that look beautiful and function perfectly but they are first and foremost safe! I can sit and confidently watch my girls looking out the window without having to worry about them getting caught up on any cord. A priceless peace of mind. If you’re looking to update window coverings in your home I would highly recommend heading over to Blinds.com. The prices are great, they are custom fitted and the personal design service FREE and so helpful! They also offer a window shopping app to help you choose your perfect window coverings. Snap a photo of your window. Select the blind or shade you’d like to try. Save it, and place your order. Available for iPhones and Android devices here. 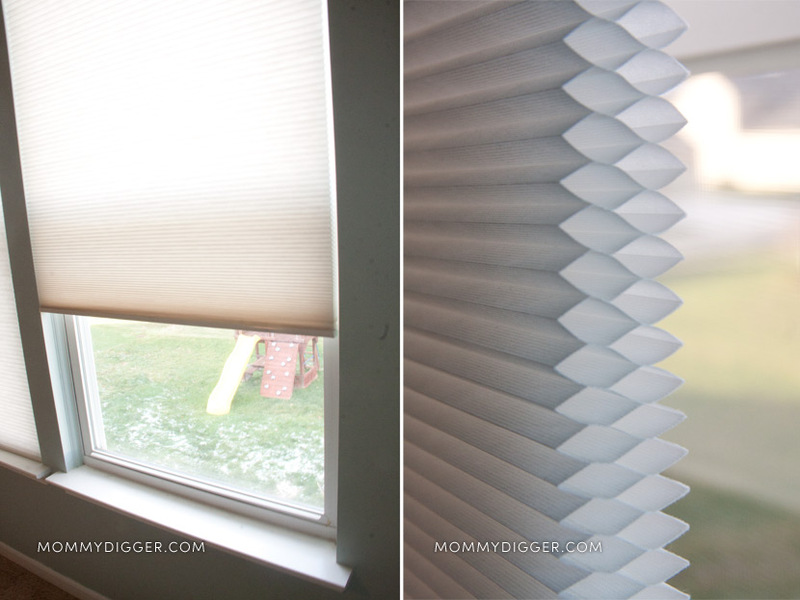 Blinds.com is offering one lucky Mommy Digger reader $100 to spend on new window treatments for your home! To enter, fill out the form below. I received a Blinds.com gift card to facilitate this review. Grande Pleated Shade or my bedroom. I would love the Graber S-Shaped Vinyl Vertical Blinds for my bedroom. I like the 2″ Deluxe Wood Blinds. They would be great for the Living Room. I’d like to get these ( Blinds.com: Elegance Grommet Insulated Drapery Panels ) for our living room! would like their london white Premium Fabric Verticals. They would look great in our den! I would like Fauxwood 2″ Blinds for my living room! The motorized cellular shades would work well in our quite large living room–aside from just making it easier to adjust without walking all around the room, a couple of the windows are behind fairly heavy furniture! I like the Bali: Foundation Smooth PVC Verticals which I would put in my kitchen. Bali Blackout Roller Shade for the bedroom. I would love to get the Fabric Vertical blinds in the contrast claret option for my living room! The Signature Roman Pleat Shades for the living room.